For other uses, see AEIOU (disambiguation). "A.E.I.O.U." was a symbolic device personally used by Habsburg emperor Frederick III (1415–1493), who had a fondness for mythical formulae. He habitually signed buildings such as Burg Wiener Neustadt or Graz Cathedral as well as his tableware and other objects with the vowel graphemes. As of 2017, A.E.I.O.U. is the motto of the Theresian Military Academy, established in 1751. 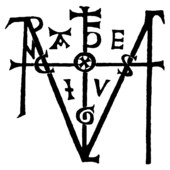 Frederick's first use of the five-letter monogram was in 1437, when he was Duke of Styria. One note in his notebook (discovered in 1666), though not in the same hand, explains it in German and Latin as "All the world is subject to Austria" (Alles Erdreich ist Österreich untertan or Austriae est imperare orbi universo). Another passage, later in the same notebook, uses the letters in sequence as the initial letters of the words in the first line of a couplet poem, showing the meaning as "I am loved by the elect" (from Latin, amor electis, iniustis ordinor ultor). Austria est imperio optime unita ("Austria is best united by the Empire"). Austria erit in orbe ultima ("Austria will be the last (surviving) in the world"). Austriae est imperare orbi universo ("It is Austria's destiny to rule the whole world"). Since Friderick wrote this acronym when he was not yet the ruler of the Archduchy of Austria and, at that time, Styria was entirely separated from Austria and was not considered to be its part until the next century, the term "Austria" in this context would not mean Austria as a territory or a nation, but rather the "House of Austria", that is, the Habsburg dynasty. 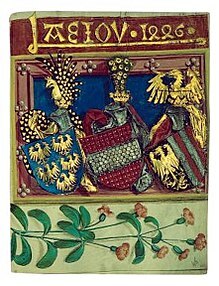 More than 300 Latin and German interpretations have been attempted over the centuries; most of these versions refer to a motto of present-day Austria or the extensive Habsburg Monarchy. Fiat iustitia, et pereat mundus – the motto of Ferdinand I.
FERT – Another motto of a European dynasty (the House of Savoy) whose meaning and origin is unclear. In his novel Ulysses, Irish novelist James Joyce uses the device for comic effect after Stephen Dedalus borrows money from George Russell, a Dublin writer whose pen name was Æ: "A.E.I.O.U." ^ "AEIOU". Die Welt der Habsburger. Retrieved 2018-08-02. ^ a b c "A", Meyers Konversationslexikon, (various authors), Volume 1, page 1, 1885-1890, web (Commons): MKL-b1-p1: has "A.E.I.O.U." on first page of entire 16-volume encyclopedia, as 3 Latin phrases: "Austriae est imperare orbi universo" and "Austriae est imperium orbis universi" with the German phrase "Alles Erdreich ist Oesterreich unterthan" noted with "Friedrich III. ", plus a 3rd Latin phrase "Austria erit in orbe ultima" with "Österreich wird bestehen bis ans Ende der Welt" ("Austria will stand until the end of the world"); note that "Oesterreich" is "Österreich" ("Oe") with first letter "O". "Ö" is not considered a separate letter in German. Andrew Wheatcroft's The Habsburgs: Embodying Empire (1995), ISBN 0-14-023634-1. This page was last edited on 20 April 2019, at 15:55 (UTC).